The Tamron/Sony 28-75mm F/2.8 comparison page is done! Sony sycophants prepare yourselves to get pissed off at my results. Remember, I don't need to please Sony, help sell their stuff, or worry about retribution, so I'm not afraid to tell you what I think. I added the Sony Carl Zeiss 24-70mm F/2.8 crops at the bottom, along with some ghosting samples. All lenses were tested at the same time, though I didn't initially think I would have time to go through all the Carl Zeiss images, that's why I started with the Tamron and Sony 28-75mm, and added the CZ crops at the end. Now that I've put all crops side-by-side, I can see which lens is optically the best, and that lens is the Tamron 28-75mm F/2.8. This is a source of aggravation for many. People always seem to want to believe the most expensive lens is the best. The Sony CZ comes in last at the wide end, and seems to match the Tamron at the long end, although the CZ is short 5mm (only goes to 70mm). You can check out the crops and come to your own conclusions. I will say I'd still buy the CZ if I were a photojournalist or paparazzi, because of marginally quicker focusing and accuracy of the SSM, better build quality, and slightly smoother bokeh. If you're only concerned with sharpness, save yourself over $1100 and buy the Tamron!! Too bad Sony, you lose this time! As I stated in the last paragraph on the comparison page, I think the Tamron and Sony 28-75mm F/2.8 are optically identical, or close to it. The differences visible may be a result of quality control standards, the Sony just making the cut, and the tamron exceeding the average etc. I've tested several Tamron lenses so far, and I've been quite happy with the results, not so with Sigma, (Sony has been good). The Sony 28-75mm was very impressive at the wide end, so I doubt there is a problem with the lens. I'm not going to try and get more copies of the same lenses and do it again, the results will stand with the caveat. I'll have the full review of the Tamron 28-75mm F/2.8 ready by mid-January. I've added the 75mm crops to the Tamron/Sony 28-75mm F/2.8 comparison page. Some people are going to get mad when they see the crops, but I can assure you I re-shot the 75mm test sets several times just to make sure focusing was as perfect as possible on each lens. I also evaluated the focusing speed and accuracy, and found little to no difference between the two using the A900. I'll add some center and corner crops from the Sony Carl Zeiss 24-70mm F/2.8 in a couple of days, so check back. Based on what I've seen so far, this comparison will also make some people mad! 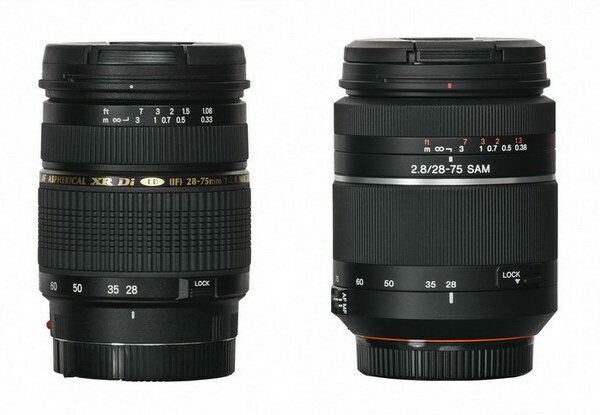 The Tamron/Sony 28-75mm F/2.8 comparison page is now open. I've managed to post; specs, light fall-off, flare and ghosting, distortion, 28mm center and corner sharpness crops thus far. Over the next week I'll add the 75mm crops, and as a special bonus, I'll throw in a few comparisons with the Sony CZ 24-70mm F/2.8, just for fun! I now have the Tamron 28-75mm F/2.8 XR Di lens in my hands, and will start on the Sony/Tamron 28-75mm F/2.8 comparison. I see the front and rear of each lens looks identical, though the body of the Tamron is slimmer. I'll be doing a complete review of this lens, but since there is so much interest in the comparison, I'll post the results as I get them, like the regular lens comparison reviews, (except on a separate page), that way I can get out the info much quicker, and you may be able to save several hundred dollars if you decide the Tamron meets your needs. The Sony/Tamron 28-75mm F/2.8 comparison is brought to you by a thoughtful reader, Steve from Connecticut. Loaning me a lens or sending a donation is a good way to support this site, and allows me to continue to help others, which is especially important in these tough economic times. Time for another lens comparison, this time I checked out the difference between the Sony CZ 16-35mm @28mm, and the Sony 28mm F/2.8 (at the top of the page). There is little difference in sharpness in the centers, but the CZ zoom is best in the corners. In fact, the CZ zoom beats this lens in just about every category. The inexpensive little Sony 28mm F/2.8 wouldn't be a very good landscape lens if you like looking at huge screen sized shots of your pictures. 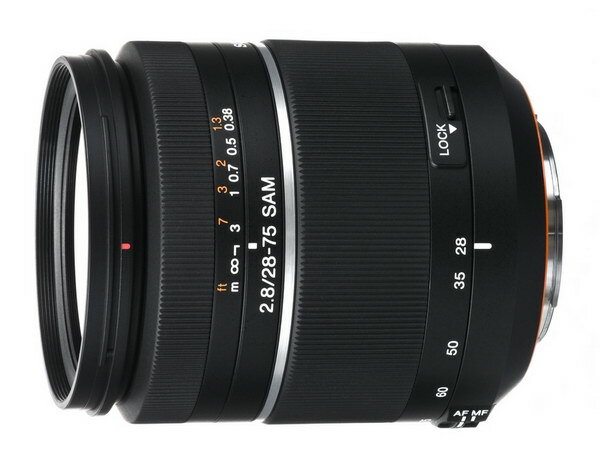 The new Sony 28-75mm F/2.8 SAM turned in a good review, check it out if you like. I'm unable at this point to determine whether or not it's the same as the Konica Minolta or Tamron models, but I'll be finding out soon, so hold off buying this lens until I do check out those less-expensive models. The Sony looks and acts similar, but I'm thinking Sony may have tweaked this lens a little (in regards to sharpness), that's off the cuff for now though. If you've emailed me recently and expected a reply, but didn't get one, please try again, as I've had some problems with my system for the last week. I always try to respond to mail, unless it's hate mail, and fortunately I don't get much of that! Go check out the biased review of the Nikon D3000 at Dpreview. They make some comparisons to the Sony A230. I guess Nikon must be paying reviewers more than Sony. To see what I'm talking about, look at the RAW noise comps, page 13, Sony is clearly the best at RAW high ISOs, but the reviewer makes excuses for Nikon like--- By golly, all you have to do is some careful post-capture sharpening and noise reduction...then they go on with; Sony is using noise reduction past ISO 800 etc, well look at the comps, which image would you rather have? Also see the resolution chart comparison JPEG, page 24, where Sony is clearly the winner, but more excuses. The reviewer seems unable to reconcile the differences between the comps and text he posted for some reason. I've been critical of Sony for (IMHO) poor noise reduction methods in the past, but this time Nikon (of all people) seems to have done a worse job, and some poor office review slug is being told to give them a pass, which leads me back to the opening line. Despite the Nikon D3000 over-exposing too much, massive high ISO noise, Moire, bad white balance in artificial light, and being a crippled camera, (will not support auto-focus with many non DX lenses), it gets a "highly recommended" rating. Dpreview has yet to review the Sony A230. Do you think the A230 would get a "highly recommended" rating? See the third sentence in the first paragraph. Sony 28-75mm F/2.8 SAM first thoughts: I've completed the APS-C review shots, and I'm just now starting on full frame shots. I notice this lens is very similar to the Konica Minolta AF 28-75mm F/2.8 lens I reviewed a couple of years ago. I think Tamron built that one, and this new one too. The Sony performs pretty good on an APS-C camera, with somewhat strong corner softness at the wide end, though it looks good by F/5.6. Someone wrote me and said they had a Tamron 28-75mm F/2.8 model they would loan me (resolved), and I told them I wasn't quite ready for it until January or so, but I'd like to check it out anytime now. I forgot the person's name, so if you have one you'd like to loan me to do a comparison review, let me know. It's a good way to share knowledge and help people make a better purchasing decision, and it also helps support this site. Another week, another lens comparison, this time I checked out the difference between the Sony CZ 16-35mm @24mm, and the Minolta AF 24mm F/2.8. There is little difference in sharpness, even wide open. The Minolta has more color fringing and distortion. So far, the older Minolta designed lenses are holding up well against the brand new Sony Carl Zeiss 16-35mm zoom. I've got my hands on the new Sony 28-75mm F/2.8 SAM zoom. I think I'll have enough time with it to offer some comments sometime mid-week, and hopefully a full review a week or so after that.